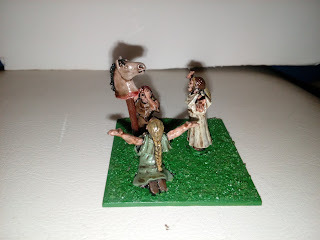 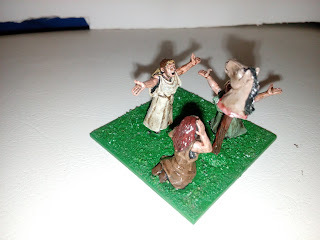 While I painted up an old hag last month to serve this role on the Dux battlefield last week, these models are the actual Wicca High Priestess(esses) for my force. And now that this little vignette is finally done, the hag can return to the role she was bought for (the model that is), namely that of the Crone my force has. These models are from the Foundry range, pack AG018 - Germanic Women, and I thought it fun for the placement on the table to actually combine them on a larger base to represent their "status" on the field, namely as the highest ranking (un)holy powers in my force. 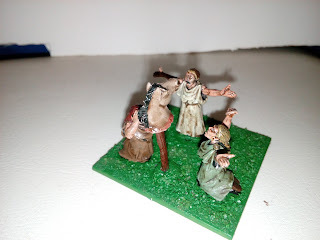 Painted like most of my dark age forces, in a simple colourscheme and making use of the Army Painter Strong Tone, they are now ready to spur my warriors onwards in the bid to win the campaign.